Polymer toy balls that significantly expand when wet have been identified as posing a potentially serious safety hazard to children, according to both the Consumer Product Safety Commission (CPSC) and Consumer Reports. These colorful, super-absorbent polymer balls, which are being marketed as toys and decorations, are reportedly being mistaken by some small children for candy or gum, leading kids to swallow them. Once ingested, the polymer toy balls can expand up to ten times their initial size and, as a result, block children’s airways or perforate their internal organs. In fact, medical professionals have reported that these toy balls only need to double in size in order to increase the risk of serious injuries to children who swallow them. Without immediate medical treatment and surgery to remove these polymer toy balls, children who ingest them are at risk of developing serious injuries, including potentially fatal cases of sepsis (blood infection). The product liability lawyers at Alonso Krangle LLP know that no amount of money can truly make up for your child’s suffering. However, filing a lawsuit against the makers of polymer toy balls, such as The Maya Group and Dunecraft, can ensure access to the financial resources needed to cover your child’s medical bills, rehabilitation, and other future needs. Our product liability attorneys are currently offering free lawsuit consultations to those who believe that their child has suffered serious injuries due to the ingestion of polymer toy balls. To learn more, please contact the lawyers at Alonso Krangle today. The CPSC’s broader look at polymer toy balls has now focused on Orbeez beads. Although packaging for Orbeez does contain warnings on both the front and back, the CPSC’s investigation has found that the warnings send mixed messages and are not comprehensive enough. Specifically, in terms of mixed messages, the front of Orbeez packaging indicates that the beads are “not for children under three years” while the back states that the beads are “not suitable for children under the age of five.” Additionally, the CPSC found that Orbeez warnings did not adequately address the risk of the choking hazard or blocked airways, which is a particularly important risk for small children. 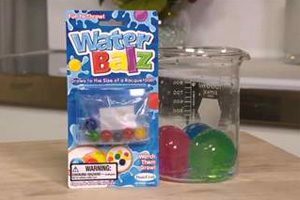 Despite the CPSC’s findings, The Maya Group has not recalled Orbeez beads and maintains that this product is “safe for children for whom it is intended” and that the balls should safely pass through children in the event they are ingested. If your child swallowed a polymer toy ball and subsequently suffered severe injuries, you may be eligible to file a product liability lawsuit against the manufacturer of the product. To learn more about the legal options available to you, please contact the lawyers at Alonso Krangle LLP by filling out our online form or calling us.